Thank you so much for the help, but I think I’ll just enjoy my own very worn Napper. Seems many others are looking, with high prices, etc. So, I’m no longer looking. Sorry that I have probably missed many, many emails. I’ve been mostly bedridden for a long time now, and very rarely see my email. I think what you do is a very kind and loving thing. We all need comfort. Sometimes it is easiest accepted by a cherished childhood friend. The very best to you. Thank you again. Perhaps sometime in the future one will show up for Wendy that is not so expensive. 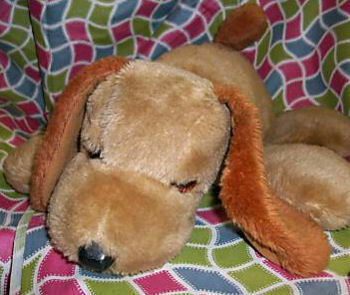 We DO still have a mailing list of people looking for this dog from their childhood. I still have my Napper, and I will always keep him! I would love to someday have another. My friend when I was little had the lamb version. Napper (mine barely, but still does, work, kinda sorta) says -I feel so lonely!,-my name is napper!, -you’re so good to me!,-I’m so sleepy, -(barking-like noise) followed with rub, rub, rub my tummy! Those are all I can remember right now. I got mine for Christmas in 1980, and I always dried my tears on his ears. He was my favorite toy of my entire childhood. Post #18599 re. Napper the talking dog. You mentioned you have a friend who had a lamb version of this toy- I am currently searching for a talking lamb called Baby BahBah, which when you squeezed the tummy, it said a variety of phrases like “I’m Baby BaaaBaaa” and “I’m just a baby”, “I’m sleepy”. It was given to me in the early 1980’s by a loving elderly lady who took me into her home when I came down with pneumonia after a broken engagement. When I recovered and moved into the dorm at the U of Pittsburgh, some mean spirited girl took baby BahBah and tossed it out of the towers window (without my knowledge) and it was forever lost. The lady somehow replaced it for me, but didn’t say where she got it. Several years ago when my teenage daughter had a similar romance tragedy, I gave her my lamb, which deeply comforted her. I miss my baby BahBah esp. cuz it reminded me of the wonderful lovingkindness of this Christian couple, whom I’ll always cherish. I have been searching for years for another. It is a lamb that is off white, laying down position with floppy ears, arms and legs, sewn on nose and mouth. Could this be the lamb version cuz it was given in the early 80’s. I had one of these dogs. I was born in 1979 and was told I got him when I was born. I called him “Snapper”, I guess because when he said “My name is Napper” it sounded like “Snapper” to me. I had to have him with me all the time. I couldn’t sleep without him. As I got older his voice box broke and my mom tried to find a replacement everywhere. One time when I was at school my dad took out his broken parts. When I came home I freaked out, dug all the broken parts out of the trash, put them back in and sewed him up. I was already in jr. high when this happened. When I went away to college I still slept with him. My boyfriend made fun of me and told me I needed to “grow up and put that old thing away”. I sadly put him away. We got married (because I got pregnant)and quickly divorced. I moved out but couldn’t take the hope chest. When I came for it, he had sabotaged me by taking and destroying many important things to me including “Snapper”. I am in tears right now just finding a picture of him. I would do anything to have him back but if there was a way to get one at all I would love for someone to let me know. Thanks and good luck to all you other lovers of “Napper”. Thanks, Danette! I’ve sent your information to the mailing list. I really want this dog. Please let me know how much you would like and how I can get in touch with you. I know it won’t be the same as my original that I took everywhere for 18 years but it will be close. Post #18599 re. Napper the talking dog. You mentioned you have a friend who had a lamb version of this toy- I am currently searching for a talking lamb called Baby BahBah, which when you squeezed the tummy, it said a variety of phrases like “I’m Baby BaaaBaaa” and “I’m just a baby”, “I’m sleepy”. It was given to me in the early 1980′s by a loving elderly lady who took me into her home when I came down with pneumonia after a broken engagement. When I recovered and moved into the dorm at the U of Pittsburgh, some mean spirited girl took baby BahBah and tossed it out of the towers window (without my knowledge) and it was forever lost. The lady somehow replaced it for me, but didn’t say where she got it. Several years ago when my teenage daughter had a similar romance tragedy, I gave her my lamb, which deeply comforted her. I miss my baby BahBah esp. cuz it reminded me of the wonderful lovingkindness of this Christian couple, whom I’ll always cherish. I have been searching for years for another. It is a lamb that is off white, laying down position with floppy ears, arms and legs, sewn on nose and mouth. Could this be the lamb version cuz it was given in the early 80′s. Code 18599: Thank you for the email about Baby BahBah! On the funds to get him! Bless you! Hi there. I just ordered Napper for my sister (it was her childhood toy, which was destroyed by her ex-fiance), but he is missing his voicebox. If anyone knows where I can buy just a working voicebox, or perhaps even a working Napper, please let me know! hi I have a 1978 mattel napper dog in good condition/working order for sale, if any ones interested please get in touch. Napper talking Dog, sold in the late 70’s early 80’s. In 2011 you found one, God bless you!, but the cost was out of my range. I have since resumed my search in a better financial state, and really REALLY hope to find one. If anyone can find a Baby BahBah I would be so greatful! Hi, although I’m searching for Nappers friend Baby Bah Bah, I’d like more information about purchasing the Napper which is listed in Post Code #18599!